Sorry it took quite a while for the second part of my empanada binge. School work just piled up. Lucky for me, I'm on a six day weekend! I don't have classes on Tuesdays and Fridays. Classes were suspended by the administration last Thursday for President Roman's investiture and were suspended again on Monday due to the closure of Commonwealth Avenue. But it's a declared non-working holiday as well making it a double whammy on my professors' class schedules... hehe! I could not believe my craving for Ilocos' sumptuous fritters is still alive since I really made it a point to buy an empanada at Ilocos Empanada in Katipunan last night. DAY 2. After breakfast, our first stop for the day was the third UNESCO World Heritage site in the Ilocos provinces, the Church of San Agustin in Paoay. On Paoay, Toti Villalon writes, "Built in 1710 under the direction of the Agustinian order, the ensemble of the church and detached bell towers are truly majestic in scale when viewed from the edge of the plaza that faces the ensemble. Detached from the church façade the bell tower tapers as it rises from the ground in a fashion reminiscent of a pagoda. The stone façade is plain at the bottom. Light, elegant decorative carving is applied close to the top of the pediment. A row of feathery stone finials that seem to gently brush the sky with delicate Oriental strokes accentuate the triangular top of the pediment. The earthquake protection system in this structure is probably its most dramatic feature. Exaggeratedly thick buttresses protrude quite a distance from the ground to be countered by a smaller volute near roof level topped by a stone finial. Swirling upwards to the sky, the massive stone buttresses take on a magical lightness." I not only went around the church but took a quick walk around the vicinity. I did not want to take photos of the Spanish-period municipio since they were currently constructing an annex on one of its two azoteas/balconajes or whatever those are called. Sigh! Beside it was the Gabaldon school building of Paoay. One thing I noticed about Ilocos towns is that they have small houses but massive churches and belltowers detached from the main church. Whereas in Pampanga, there are magnificent and elaborate mansions but smaller churches. Jojo Mata later explained that in Ilocos, most churches also doubled as forts, serving as protection against Chinese or Moro pirates. The massive belltowers were built at a distance to protect the church from damage in case the tower collapsed during an earthquake. Since we didn't have that much time, I wasn't able to visit the other side of the church where one could find the ruins of the church convento. Maybe next time. Next on the itinerary was the "imperial birthblace" of the Marcos clan back in Batac. Reinventing family heritage is what has been done in Batac, a result of the dillusions of royalty of my fraternity brod, President Ferdinand E. Marcos and First Lady Imelda R. Marcos. Since the Marcos Mausoleum is in Batac, people often mistake the town for his birthplace when he was actually born in Sarrat. The museum of another fraternity brod, Marcos' chief rival Sen. Benigno "Ninoy" Aquino, finds itself in a similar situation being located on the Cojuanco property of Hacienda Luisita in Tarlac City rather than the Aquino hometown of Concepcion, Tarlac. Batac underwent a sort of metamorphosis during the Marcos administration to make it appeal to the fantasies and edifice complex of the former first family. And the Marcos Mausoleum is the pinnacle of that folly with the mortal remains of the late dictator preserved and enshrined there. The advanced wax preservation technique used to keep his body intact was employed in the hope of pushing the Marcos legend beyond Philippine shores, putting him side by side with other powerful leaders such as Vlademir I. Lenin, Mao Zedong, and Ho Chi Minh whose embalmed bodies have been preserved for future generations. After paying homage to the Apo, it was off to the provincial capital, Laoag City to visit the Museo Iloko, the obra mata, I mean maestra of Archt. Jojo Mata. The award winning project, the adaptive reuse of an old Tabacalera building, gives visitors a glimpse of the culture of Ilocos Norte. After that brief tour, we were given time to loiter around Laoag. So it was off to the plaza for photos. One sad thing about Laoag is the new symbol that welcomes you. Before, it was only the massive sinking belltower which one saw while traversing the bridge that brought you to the town proper. Now you have golden arches as well. The local government should be hanged to dry from the big yellow "M" for allowing such an incident to happen. They should follow the lead of UPLB officials who raised hell and ordered the removal of the large golden arches which were installed near the entrance of the UPLB campus. After taking photos, it was back to the dap-ayan where the bus was waiting. And another two servings of empanada! With my stomach filled, I had to skip the picnic lunch we were going to have in Sarrat, the birthplace of Marcos, which was put on the social map as a result of the elaborate and costly wedding of Irene Marcos to Greggy Araneta. The facade of the Sarrat Church actually collapsed together with the belltower during an earthquake in the early 1980s. It was repaired just in time for the Marcos-Araneta nuptial. Beside it is a huge convento and a complex of brick ruins that used to house government offices such as a courthouse and jail. Labels to rooms read "Torture Chamber" and "Garrote Room" reminding visitors of the grim happenings that used to occur in the place. After lunch, it was off to Pagudpud with a brief but important stopover in Burgos. A UNESCO World Heritage hopeful under the listing "Lighthouses of the Philippines" and if those proposing their inclusion get their act right, the Cape Bojeador Lighthouse in Burgos is simply stunning, a solitary masterpiece majestically perched on the foothills at the northern tip of Luzon. As people well-versed in UNESCO selections would say, it's a matter of packaging if you want to get listed. Believe it or not, the city of Rome was rejected when it applied the first time mainly because they submitted the whole city which had a lot of alterations already. But the current listing shows that they selected important sites in the city now listed as the Historic Centre of Rome. Some people are proposing to have all the lighthouses declared. But part of application is proof that a site can and will be preserved. Some lighthouses are already in bad shape. And these rotten eggs may become the reason for the rejection of the whole lot. It would thus be better to pick say three or five of the best examples of Philippine lighthouses for submission to the UNESCO list. That way, the pitch would be more managable with lesser opportunities for scrutiny from the UNESCO experts. Batanes had to learn the hard way with their rejection last year. In fact, the islands were a shoe in for listing. But the provincial government played know it all, or in the vernacular, nagmarunong! They felt they could do it on their own and purposely did not contact the Philippine experts who had been hard at work preparing the application for Batanes. To make the long story short and to put it bluntly, they fucked up the application requirements. Nothing was to stop us from a dip in Pagudpud after Burgos. Nothing except the windmills of Bangui which led to a five minute stop. And a storm brewing which brought waves lashing along the shoreline! But despite the intermitent downpour and gray skies, a swim in the beach was a fun finish to the Ilocos tour. It was now time to begin the trip down. But not without a stop in Laoag's dap-ayan for more empanadas! Hehe! The stopover was actually for those who wanted to buy bagnet but I had something else on my food list, two empanadas for dinner. After a brief stop in our dorm in Batac, it was back to Manila and straight to class. We arrived 9 a.m. Monday, just in time for me to cram a paper and attend my 10 a.m. class. Ilocos Norte & Ilocos Sur: Empanada binge! Yup, I had not one... not two... but seven of those empanadas which Ilocos is most famous for! For urban denizens like myself who rarely make that long trek up north, I might as well savor as much of the local flavors as my stomach could handle. I left for Ilocos 9 p.m. last Friday together with an Arch 17 (Philippine architecture) class I was sitting-in with. Good thing the heritage conscious professors are friends of mine - Jojo Mata, Paolo Alcazaren and Nonoy Ozaeta. So to make the long story short, I got to tag along. The schedule was quite tight. We intended to leave the night before but since most of the students had a physics lab class they couldn't miss on Friday, we had to cut the trip short by a day. Our first leg on the itinerary was a 3 a.m. stop at La Union's Oasis Resort Hotel to continue our brief sojourns in dreamland while the bus was stopped. Our tour organizer Tracy explained that sleeping while the bus was in a complete halt had a different effect. Breakfast was at the same place. So we all got up at 5 a.m. for the usual 'silog morning meal. The first real stop was just a few kilometers away. Popularly known as the Pindangan ruins, these are remnants of the first church of San Fernando, built of coral stones in 1674. The area was actually the old center of a settlement that was to become today's San Fernando, La Union. Upon seeing the ruins, we quipped, had these been in the City of Manila, Lito Atienza would have had it demolished under his so called "Buhayin ang MayniLA" program, maybe turned into another park & ride facility or another school building he could actually place elsewhere. For more on Atienza's infamous heritage destruction movement, you can visit the Heritage Conservation Society (HCS) blog. 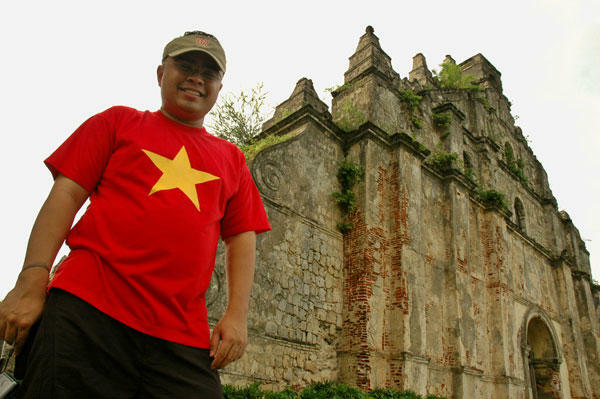 The Pindangan ruins are themselves an example of heritage issues between players such as the church, state and concerned groups. The ruins are owned by a Catholic organization, as they are within the grounds of a convent. The issue here is how the local goverment could manage the ruins from a heritage conservation point of view given that the ruins are on private property, belonging to a private religious institution. Right beside the ruins is Balay ni Atong, residence, studio and home gallery of Ilocano artist Al Valenciano. After college in Manila's De La Salle University, Al had already "started working on his desk as an auditor at the Philippine Commercial International Bank in Metro Manila’s Wall Street District, [when] his past tugged at him incessantly that to ignore it would have been impolite." His write-up continues, "By this time his family maintained a second residence in La Union south of Laoag City and still four hours away from Manila. The La Union home is at the corner of the rice field. Adjacent to it is the ruins of a church built by the Spanish friars in the 1700s. What are left are ramparts overgrown by tall weeds, some of its sections, the favorite nesting place of expectant sparrows. The church has been a marker of many symbols. This is where Atong resolved to go back to his interest in painting." An hour or so away was our next destination, Sabangan Cove in Ilocos Sur, known for its abel Iloco loom-weaving industry. What greeted us at this once beautiful beach was an Atienzic local government project! Atienzic is a term which heritage advocates quip when they see projects with the Atienza penchant for destroying spectacular views and heritage sites. The sorry sight was a concrete boardwalk with numerous hideous concrete commercial huts lining the beach. A few minutes north was a UNESCO World Heritage site. As Toti Villalon puts it, "The uniqueness of Filipino church architecture was honored by the UNESCO World Heritage Committee by inscribing four churches in the UNESCO World Heritage List as the Baroque Churches of the Philippines." And for Ilocos Sur, it is the Church of Nuestra Señora de la Asuncion in Sta. Maria. The National Historical Institute also declared the church, used as a fortress during the Philippine Revolution of 1896, a National Landmark. According to Villalon, "Built in 1765 under the direction of the Agustinian order, the ensemble resembles a citadel sited on the crest of a solitary hill rising above one side of the Santa Maria town plaza. The architectural ensemble presents its side and detached pagoda-like bell tower rather than its façade to the town. Thick contrafuetes (buttresses) are attached to the walls, reinforcing the structure against earthquake damage. The bell tower is constructed a distance away, protecting the main church structure from possible earthquake damage. Approached on foot by ascending a long, wide flight of piedra china, steps that rising from the edge of the town plaza, the small, cramped plaza at the top of the steps is bounded by the church façade that faces the convento, enclosed by an arcaded bridge that connects both structures." Most people don't know that the UNESCO site stretches to the other side of the hill, where the ruins of a hidden cemetery could be found. Trekking to the place was a blast from tomb raiders since we had to brave the tall weeds and foliage that covered most of the path. But we weren't disappointed with what we saw. What disappointed us was that several large trees were cut, allegedly on orders of the vice-mayor. In front of the stripped part of the hill were a group of men with shotguns. We let the authorities in the NCCA know about it since this is a UNESCO declared site. That was up the hill to the church, and down the hill to the cemetery. And then back up the hill and down to the bus... pant, pant, pant! We were off to another UNESCO World Heritage site, the Historic Town of Vigan. The photos from Vigan could speak for themselves. But let me point out that this beatiful heritage city is not without faults. And McDonald's, Jollibee and Chowking are among the culprits. The ruins of a magnificent seminary were demolished to give way to these "signs" of progress. If you were to ask me, the solemnity and elegance of Plaza Salcedo should have been preserved. Now, these three fastfood chains stand side-by-side with the Metropolitan Cathedral of St. Paul, the Arzopispado de Nueva Segovia, the Ilocos Sur Capitol, the City Hall of Vigan, and other important heritage structures in the vicinity. The people responsible for this desecration of heritage should be burned at the stake! While the students enjoyed (or despised) the "amazing race" planned for them in Vigan - they had to look for a painting of the Basi Revolt in the Burgos Museum, mold a clay pot the traditional Ilocano way, have a photo taken at the Quema House, measure the perimiter of Plaza Salcedo using a one-foot wooden ruler, draw the retablo of the Vigan Cathedral and identify all the santos, and eat five Vigan empanadas and a bag of chichacorn among others... hehehe! - I went straight to the market to buy woven blankets. Back to the bus, back to sleep, and off to Batac where we were to spend the night. Batac is said to produce the best Ilocos empanada. So after dinner, we went to downtown Batac to savor the fried delight Batac is proud of. Heaven indeed! Time to disect the famous fritters with empanada anatomy 101... the shell is made of rice flour with orange food color to make it "attractive." The bright orange color makes it look artificial though and coupled with the oil, can turn-off any health-conscious individual. But together with a filling of grated green papaya, mongo sprouts, garlic, longganiza and an egg, this delicacy fried to a crisp is scrumptuous and irresistable! And don't forget to eat it with the vinegar-chili dip made from pure sukang Iloco. After having two that night and taking a short walk around the plaza, I realized that there was an empanada variety unique to one of the shops. We all know about the double special - that's two servings of egg and longganiza in one empanada. But one shop had a jumbo - the usual ingredients plus crushed hotdog! So I just had to try it, which raised my empanada tally for the night to three! Simply superb! Did you just come back from that long-deserved vacation in your home province? Maybe you and your barkada recently arrived from a road trip up north to Baguio, the Cordilleras, and Ilocos? Or was it down south to Bicol? It may have just been to nearby Bulacan and Pampanga, or to Cavite, Laguna, Batangas, Rizal and Quezon, the Southern Tagalog provinces we collectively call Calabarzon? Or was it a plane or boat ride away to Iloilo, Negros and Bohol, or cosmopolitan Cebu and Davao? So what is with this roll call of Philippine tourism destination when the summer break is already over with tons of academic requirements just waiting around the corner? More than just offering a vacation option, each of these destinations showcases a unique aspect of Philippine culture. The heritage houses such as those in Vigan, Taal and San Juan in Batangas, Sariaya and Silay, the ornate baroque churches of Bohol and other provinces across the country, the unique upland culture of the Cordilleras, and the rich and colorful Muslim way of life down south in Mindanao, all have their own vital contributions to the endangered fabric known as the Filipino identity. What is Filipino then? What is being Filipino? Are you proud to be Filipino? These are apt self-reflections that are most relevant at this juncture as the Filipino nation remembers the assertion of its freedom. Indeed, these are fundamental questions Juan de la Cruz must answer if he is to progress as a nation. The identity of any nation is always dictated by its culture, the way of life its society adheres to. Specifically, it is a system of shared beliefs, values, customs, behaviors, and artifacts that fuse a society together. This system is what members of society utilize to cope with everyday life. That however is just one definition of culture. American anthropologists, Alfred Kroeber and Clyde Kluckhohn, published a list of 160 different definitions of culture in 1952, indicative of the diversity of the anthropological concept of culture. John H. Bodley, Chair of the Department of Anthropology at Washington State University summarized their list under eight general definitions namely: topical (culture consists of everything on a list of topics, or categories, such as social organization, religion, or economy), historical (culture is social heritage, or tradition, that is passed on to future generations), behavioral (culture is shared, learned human behavior, a way of life), normative (culture is ideals, values, or rules for living), functional (culture is the way humans solve problems of adapting to the environment or living together), mental (culture is a complex of ideas, or learned habits, that inhibit impulses and distinguish people from animals), structural (culture consists of patterned and interelated ideas, symbols, or behaviors) and symbolic (culture is based on arbitrarily assigned meanings that are shared by a society). Despite the broad coverage of cultural definitions, focus will be on culture as social heritage. In particular, concentration is on tangible cultural properties that transcend generations and their inherent potential to become symbolic and serve as fervent unifying symbols that would guide the Filipino nation in its search for an enduring national identity. A cultural property, according to Sta. Maria, includes all forms of human creativity by which a nation can reveal its identity. Tangible ones form the physical expression of the national memory or the cultural heritage. Among these material symbols mentioned by Sta. Maria are historic sites and structures such as the numerous baroque churches, mosques, and elaborate ancestral houses, as well as buildings and groups of architectural and engineering works that include gardens, plazas, parks, forts and fortifications and historical ruins. One part of our Philippine cultural heritage, albeit intangible, are proverbs which are commonly called salawikain. In fact, one is so overused, it has become cliché: “Ang hindi marunong lumingon sa pinanggalingan ay hindi makakarating sa paroroonan.” But despite the repeated mention of these lines, do Filipinos actually listen to the wisdom the lines try to impart? It must be stressed over and over again, to such a stubborn Filipino nation which places foreign cultures on pedestals higher than its own, that it will not progress as a nation if the development is superficial. If Juan de la Cruz embraces urbanization and modernization by getting rid of what makes him or her Filipino, moving forward would be pointless. The nation may look perfect on the outside; but inside it is empty. Its soul is dead. Architectural heritage forms a large and visible part of tangible Filipino culture and identity. However, these historical structures are constantly faced with development pressures. And as a result, they are sacrificed in the name of progress. The country is proud for example, that Vigan is a UNESCO World Heritage site and yet the remains of a grand centuries-old seminary was demolished in the said city, replaced by fast food chains such as McDonald’s and Jollibee. It appears McDonald’s was not content when it prominently positioned their golden arches on the grounds of the Balayan Church in Batangas, one of the 26 churches declared by the National Museum in 2001 as National Cultural Treasures. The stewards of church property simply could not resist the allure of extra income. In Banaue, one would see concrete buildings and shanties on the rice terraces instead of the traditional Ifugao houses. Another site inscribed in the UNESCO World Heritage List, the Rice Terraces of the Philippine Cordilleras (known as payo to the Ifugao) are also included in the UNESCO List of World Heritage in Danger. The charming Pines Hotel at the top of Session Road, a remnant of Baguio City’s hill station legacy, as well as the pre-war YMCA Building beside Manila City Hall were both replaced by gargantuan SM malls that could have been placed in some other location. They not only clutter the historic skylines, but contribute as well to the traffic and pollution problems both areas are experiencing. Imagine how many pine trees had to be cut to build that mall in Baguio City, which according to a World Bank study, was said to have the worst air quality among key Philippine cities! The deterioration of the quality of life of these areas is just too much a price to pay for the greed of a few individuals. Built heritage resources, according to Prof. Rene Luis Mata of the UP College of Architecture, also includes what is called industrial heritage, a category which includes train stations, lighthouses, sugar and rice mills, ice plants, factories and bodegas, bridges, irrigation systems and canals. “We are unfortunately unaware of this heritage category,” says Mata, “and they are often the first to go. The technical advances of a period in our history are worth saving, too." Indeed, if Filipinos do not learn to look back and value the past, the nation will never reach its destination. In fact, it can be noticed, more often than not, that countries which fight hard to preserve their culture and architectural heritage are those which progress more completely. Just take a look at other ASEAN countries such as Singapore, Malaysia, Thailand and even Vietnam, where in their key cities, architectural heritage is very much protected. When Vietnam and China were actively desecrating their heritage in the name of a new cultural revolution, their economies were in shambles. Today, the world is witnessing a complete turnaround. These Asian countries may be spending millions of dollars to restore their old buildings and heritage sites but are able to cash in on their investments with millions of tourists arriving at their doorsteps annually. But more than the returns on investment, these cultures are able to strengthen their national identities. And despite the influx of tourists, they are still able to maintain the original settings and cultural landscapes that tourists flock to visit. In the Philippines however, tourism is becoming a curse mainly because we have yet to understand why tourists come to our country in the first place. When going abroad, Filipinos look for shopping areas and malls most of the time. That is why by building shopping malls, the country in general thinks that tourists will start arriving as well. That is not at all the case! Tourists visit a country more so to experience its culture, savor the food, visit cultural and historical sites, and not to simply shop in malls! And yet Filipinos destroy these unique aspects of Philippine culture in the name of progress, in the hope that tourists will come and visit. If the Philippines will not change that mentality, it should not be surprised why it gets the crumbs of the tourism industry, one which according to the United Nations Educational, Scientific, and Cultural Organization (UNESCO), is regarded as the biggest in the world ahead of automobiles and chemicals. Juan de la Cruz can find his identity only when he can truly declare himself culturally independent. “A group, society or nation achieves cultural independence,” Sta. Maria writes, “when its own culture remains as secure and intact as it wishes it to be. It achieves cultural independence when its people have the strength and maturity to select what they want or need from the past, the present and the projected future.” She adds, “Every generation will have to decide how to manage change, how it will alter its culture. Everything changes. Cultural development is concerned with the quality of change people make for themselves.” And heritage conservation plays a big part in the selection of what Filipinos need from their past. By advocating the protection and preservation of our built heritage, cultural and historical sites and settings according to the HCS, the nation would be upholding the Philippine Constitution which states that heritage and culture should be developed and preserved for national identity. Cultural advocacy according to Sta, Maria “is the act of calling attention to cultural concerns.” She adds that in the Philippines, cultural advocacy is in its early stages. But it is however vital for communities, local and national organizations and other concerned groups and individuals to engage in such an advocacy if the right to culture and the proper directing of support to cultural development is to be protected. Architect Augusto F. Villalon, an HCS member who writes a regular Monday column in the Philippine Daily Inquirer, mentions that “high level of achievement does not equate to only what is grand and monumental. The ordinary and the everyday equal, and many times surpass, the grand and monumental in level of achievement.” Villalon continues, “The Rice Terraces of the Philippine Cordillera cannot be the grand monument they are recognized to be without the support of the farmers who live, plant, harvest and maintain the site. Unrecognized for being the true heroes of the rice terraces, their lives revolve around the site. For the coming weeks, the Philippine Collegian will be featuring these places we have always considered ordinary. And there would be no better place to begin with than the architectural heritage of the UP Diliman campus. With the centennial of the University of the Philippines just around the corner, it would be most proper to revisit these sites scattered in the various campuses of the UP system, and look beyond the facades, taking a much deeper look into their history and contributions to the heritage of the entire nation. If Juan de la Cruz is indeed to progress as a nation, he should stop being cynical about the country and put his money where his mouths is. Juan de la Cruz must cease the unnecessary and incessant complaining and start doing his or her share, tangible efforts, to uplift the standard of living of the entire Filipino nation. But before such concrete results could be achieved, the country rid itself of the habit of simply complaining which is so rampant even in this campus, and rebuild a society with “pride of place” as it is called. In other words, Juan de la Cruz should start being proud of his country if he or she wants it to move forward. And being proud is not just saying that one is proud of the country, but sincerely making sacrifices for it.